Agnes and Jacques from la Paonnerie which is in the Loire Valley near the town of Ancenis are passionate about producing wines without the addition of sulphur to ensure that the wines retain their life and their vibrancy. They practice biodynamic agriculture in their large holdings (around 22 hectares) which are scattered across about 35 kilometres on either side of the Loire River. The lieu dit, La Jacquerie, is entirely owned by La Paonnerie.The vineyard work is immaculate and their approach to biodynamic viticulture leads to the fruit being of very high quality. Recently they have added some special friends to assist with the vineyard management. Two beautiful pigs now roam the vineyards eating the weeds and turning over the soil without damaging the precious biome which includes the all-important worms, bacteria and fungi.They vinify with natural yeasts and do not filter or fine their wines. Their vineyards straddle a number of appellations including Anjou, Coteau d’Ancenis and Muscadet. 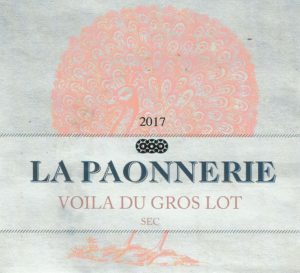 The Domaine la Paonnerie Anjou Villages 2013 Sans Soufre is a blend of 66% Cabernet Franc and 34% Cabernet Sauvignon picked from the Clos de la Jacquerie which the Carroget’s own exclusively. The grapes are picked when the Cabernet Sauvignon has reached the desired level of ripeness. This is a lively, vibrant wine that is very gluggable! The wine is fermented with natural yeasts and is neither filtered or fined. This is a light, lively delicious red wine that goes beautifully with robust foods. The Domaine la Paonnerie La Blanc de la Jacquerie is a 100% Chenin Blanc picked from the Clos de la Jacquerie which the Carrogets own exclusively. The grapes are picked when the Chenin Blanc has reached the desired level of ripeness. This is quite a complex wine that displays the beautiful Chenin character that the Loire region is so famous for. The wine is fermented with natural yeasts and is neither filtered or fined. This is an elegant delicious white wine that goes beautifully with robust foods. No sulphur has been added at any stage. 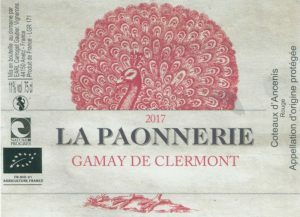 The Domaine la Paonnerie Coteaux Ancenis Gamay de Clermont is made from 100% Gamay Noir à jus Blanc. The grapes were picked from a neighbours vineyard due to the damage caused to their vineyards in 2017. The wine was fermented in fibreglass tanks using the natural yeasts on the grapes and is neither filtered or fined. This is a light, lively delicious red wine that goes beautifully with food such as lamb chops or roast chicken or a robust cheese. This cuvee also has no sulphur added at any stage during the winemaking process. Coteaux Ancenis is the name of the AOP appellation that the wine is entitled to. The Domaine la Paonnerie Coteaux d’Ancenis “Simplement Gamay” 2014 is made from 100% Gamay Noir a jus Blanc. The wine is fermented in fibreglass tanks using the natural yeasts on the grapes and is neither filtered or fined. 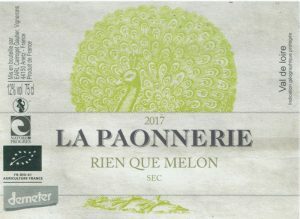 The Domaine la Paonnerie Rien que Melon is aptly named as there is nothing in the bottle except for juice from Melon de Bourgogne grapes picked from vines that are about thirty years old. There are no additions to this juice – not even any sulphur. It is a delightful wine that expresses the terroir from the vineyard which is on the banks of the Loire River about halfway between Angers and Nantes in the beautiful Loire Valley. The vineyards are at the eastern end of the Muscadet region and Jacques allows the wine to go through malolactic fermentation which is unusual in Muscadet and more like what happens in the neighbouring Anjou appellation. The grapes are crushed with a little time for skin contact and then transferred to tanks to ferment and mature for about six months before bottling. This is, for us, the best vintage we have had of this wine. There’s a mild sweetness to balance the acidity of the Melon de Bourgogne that wasn’t in the 2015 vintage, the last one we had, that makes it quite compelling. 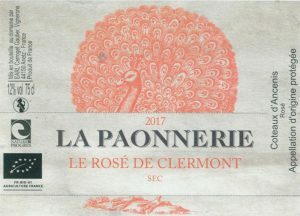 The Domaine la Paonnerie Coteaux d’Ancenis Le Rosé de Clermont 2017 is made from 100% Gamay Noir a jus Blanc. This wine did not come from their own grapes, they were given a plot by some friends who also do organic viticulture. The result is a beautiful pale pink rosé with a freshness that is very appealing. The wine is fermented with natural yeasts and is neither filtered or fined. This is a light, lively delicious rosé that is perfect for sipping at any time and is also a great match for a wide range of foods as it will not overpower them. It also has a very attractive mouthfeel and a lingering finish. The Domaine la Paonnerie Coteaux d’Ancenis Rose 2013 is made from 100% Gamay Noir a jus Blanc. The wine is fermented with natural yeasts and is neither filtered or fined. This is a light, lively delicious rose that is perfect for sipping at any time and is also a great match for a wide range of foods as it will not overpower them. It also has a very attractive mouthfeel and a lingering finish. The Domaine la Paonnerie Vin de France Sans Soufre Ajouté Voila du Gros Lot” is made from 100% Grolleau Gris (also called Groslot in the Loire) grown in granitic soils. The grapes are hand harvested and then whole bunch fermented. The skins are left in contact with juice for a number of days as per the Italian tradition of creating orange wines. So, this is a rosé because there has been some skin contact, but because it has been done with white grapes it falls more into the orange wine tradition. The wine is fermented with natural yeasts and is neither filtered nor fined. This is a light, lively delicious rose wine that is perfect for sipping at any time and is also a great match for a wide range of foods as it will not overpower them. This wine also has no sulphur added at any stage during the winemaking process. This is a new cuvee for Paonnerie. It is made from 100% Chenin Blanc (which is called Pineau in this area). The wine is made from grapes grown on vines that are over 100 years old in the commune of Saint Heblon which is the commune neighbouring Anetz where the Paonnerie winery is located. The age of the vines means that the yield is a very low 20 hectolitres per hectare. While the yield might be low the benefit is that the grape juice is very concentrated and has high minerality. The wine is fermented naturally and matured in old oak barrel. It is bottled without fining or filtration or the addition of any sulphites. This is another new cuvee for Paonnerie. It is made from 100% Chenin Blanc (which is called Pineau in this area). The wine is made from grapes grown on vines that are over 100 years old in the vineyard called Les Champs Jumeaux which used to be a famous vineyard in this part of the Loire Valley before the vineyard fell into disrepair. It has since been revitalised by Jacques and Agnès. The wine is fermented naturally and matured in old oak barrel. It is bottled without fining or filtration or the addition of any sulphites. It is a quite rich wine showing true Chenin character. It is a good wine to cellar for a few years.